Is YouTube Kids Safe for Kids? This might be one of the most popular questions we receive from parents during our evening presentations. Our stance with ANY application that is connected to Google and/or YouTube is that you VERIFY before TRUST. Both Google and YouTube have a tarnished history in protecting our kids from junk. I just don’t trust either of them. But, YouTube Kids seems to be trying. Please read our updated app review below with the latest news. App Store description: Google-owned YouTube launched the toddler-oriented app in 2015. It has described it as a “safer” experience than the regular YouTube video-sharing service for finding “Peppa Pig” episodes or watching user-generated videos of people unboxing toys, role playing their favorite cartoon characters, or teaching kids how to dance. According to Google, “Videos available in the app are determined by a mix of algorithmic filtering, user input and human review.” It has been a huge success, with >70 billion video views since inception. App Store rating: 4+ (according to the Apple App Store, “Made for ages 0-5”). What do parents need to know about YouTube Kids? Its history is very tarnished. Just do a Google search for “YouTube Kids news” or “YouTube Kids suicide” and you’ll find an endless stream of articles decrying horrible videos (sexualized cartoon characters, violence, self-harm) that slipped through the machine learning controls. Related post: How do you Configure YouTube’s Parental Controls? Parents now have much more control over what their kids watch (updated Sept. 14, 2018). Parents now have more content control. A recent update create an additional category, “Older,” to the list of options when creating a child’s account (see screen shot (1) below). This “Older” category is intended to satisfy the demand for more tween appropriate content. 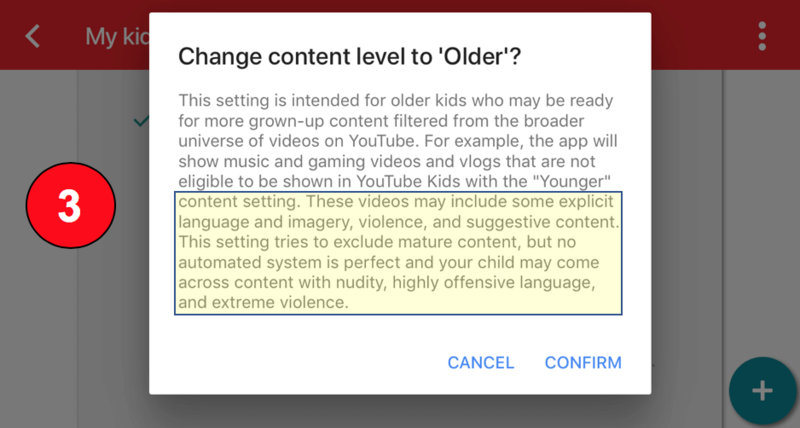 Screen shots (2) and (3) below show YouTube Kids’ explanation for what is included in the “Younger” and “Older” categories. Pay close attention to the caveats placed on the content by YouTube (highlighted in yellow). Based on our searching, the Older category allows access to Ted Talks, music videos (some of a mature nature), LGBTQ explanations, Ellen episodes, Saturday Night Live skits, etc. Parents now have more search control. When setting up a child’s account, you will be asked whether or not you want the search feature on or off, as shown in screen shot (4) below. If you keep search “on,” it means the kid can search through everything that the YouTube Kids algorithm has deemed appropriate for the age category selected in screen shot (1) above. 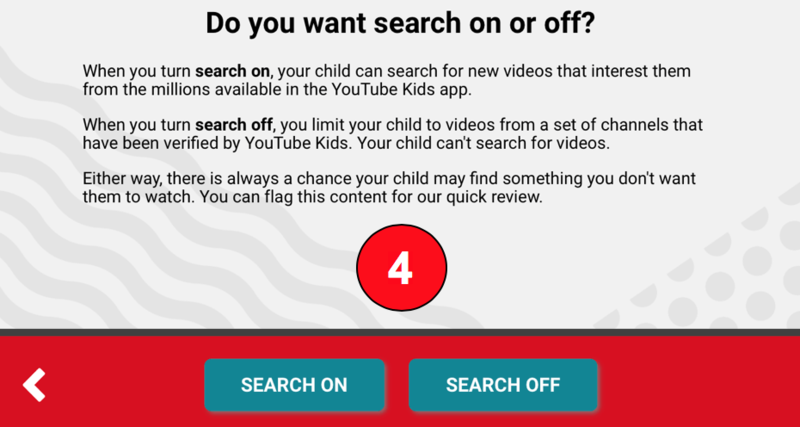 If you keep search off, then YouTube Kids will allow access to a more limited set of videos that have been human verified as being OK for the age category. Any of the options for search and age content can be changed by the parent typing in his/her Google password after clicking the setting icon in the lower right corner (on iOS). There are ads in YouTube Kids. But, they’re supposed to comply with a strict set of guidelines, explained here. We wish there weren’t any ads. Note: Common Sense Media has written an extensive “Ultimate Guide” for YouTube Kids which explains other, maybe not quite as important aspects of the app. We’re not going to regurgitate them here, but if you’d like to read more, please follow this link. YouTube Kids app bottom line – is it safe for your kid? Chances are, young children are the ones using the app, which by itself, begs parents to always be present. 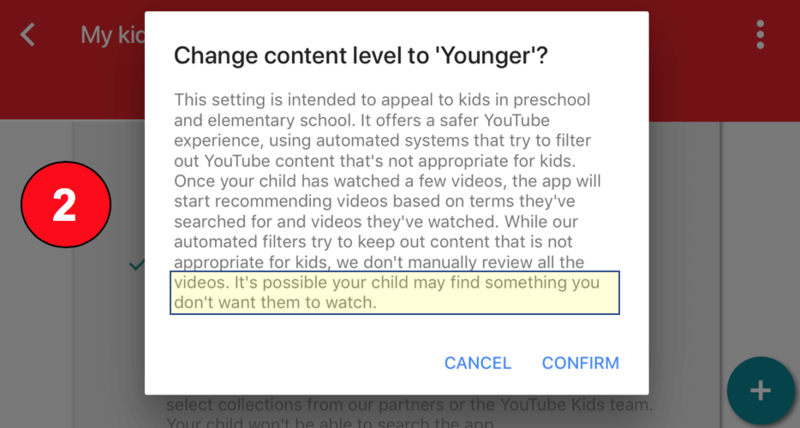 It seems YouTube has improved controls enough where we think it’s fine for kids to be using the app as long as they are supervised. It’s Google! And, thus far, their products have a less-than-stellar track record. There’s just too much content for them to manage. Which means, parents have to step in and manage it instead. A non-YouTube Kids option with even stronger controls (every video is approved by a real person) is Jellies, which was created by a smart dad who was tired of YouTube’s shenanigans. It’s 30 days free and then $4.99/month.